Education Officer Harry Needham and General Representative Ashish Nagesh have put forward opposing NUS motions for SRC 2. Needham is putting forward KPIs for reaccreditation to the National Union of Students (NUS), while Nagesh is proposing a disaffiliation referendum. The issues will be debated on Tuesday night at SRC 2. Needham has proposed accountability and transparency KPIs (key performance indicators) for the NUS, which have already been developed in conjunction with seven other universities. A letter to the President and General Secretary of the NUS dated from February, signed by Eleanor Kay, President of ANUSA, as well as the presidents of the student guilds at Curtin, UWA, Flinders University, Edith Cowan, the University of Sydney, Newcastle University, and the University of Melbourne states that “should the NUS fail any exit KPI, then all our organisations will refuse to pay any accreditation fees in 2018”. The KPIs are similar to the unmet KPIs ANUSA proposed in 2017, including that a non-factional Returning Officer be appointed for the NUS National Conference (NatCon). The KPIs are divided into two categories. Firstly, there are exit KPIs, including a number relating to accountability via communication with campus presidents, and “that the NUS does not condone the use of violence as a legitimate means of protest”. Secondly, there are assessable KPIs, which will be graded by each campus in August. These mostly relate to National Office Bearers fulfilling their obligations via communication of their activities – but also include a provision “that the actions and policy of NUS are substantially in line with the interests of the UWA [University of Western Australia] Student Body”. The full KPIs and letter may be found in Reference O to the SRC 2 Agenda. The 2017 Queer* Officer Ariel Scott has proposed a motion to delay discussion of NUS accreditation to SRC 3 to allow the SRC time to consider the KPIs. 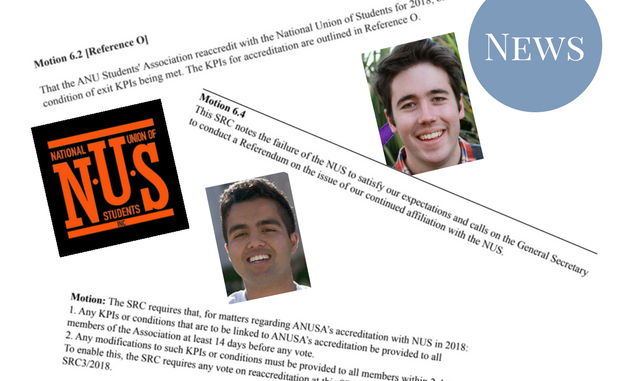 The motion, seconded by Nagesh, alleges that the ANUSA Executive has “selectively provided some SRC members with this information [on the KPIs], notably Department Officers, in an attempt to influence votes”. Scott’s motion describes the limited information provided to the SRC on ANUSA’s discussions regarding the KPIs as “blatantly disrespectful to the independence of the SRC” and further alleges that members not informed of the discussions were not told “likely due to their views regarding NUS and/or their political affiliations”. Nagesh, the current ANU Liberal Club Treasurer who ran a ticket in the 2017 ANUSA election to withdraw from the NUS, has proposed a referendum on the continued affiliation with the NUS. The motion, seconded by Kathryn Lee, argues that the NUS has failed to make meaningful attempts to satisfy the expectations of ANU students for the past three years, highlighting that ANUSA has not reaccredited in the past two years. Nagesh refers to disaccreditation as a “temporary fix to a long standing problem”, and that the more permanent move would “affirm ANUSA’s stance on taking feedback, being transparent and accountable to students.” Nagesh proposed that such a referendum should be conducted online to reduce costs. He also cited s6.7 and 6.7.1 of the ANUSA electoral regulations, which instruct how to call a referendum – however, to Observer’s knowledge, these sections are no longer found in the regulations, having been excised in 2016. ANUSA affiliated with the NUS in 1998 after a four day referendum with a turn out of 1775 votes, and a margin of only 194 votes. The issue of affiliation has remained contentious given the aggressive nature of NatCon, and the lack of transparency of the body. The last referendum held by ANUSA was in 2014, where 82% of students voted to divest from fossil fuels. Harry Needham did not respond to requests for comment. Ashish Nagesh initially responded to requests for comment, but later retracted his comments, citing the ANUSA Media Policy.